In the second part of our exclusive coverage, Lee Williams returns to Hillside Golf Club. He catches up with Links Manager, Chris Ball, Club Mechanic, Ian Smith and John Deere Limited Turf Division Sales Manager, Chris Meacock, to discuss machinery and further preparations for the Betfred British Masters 2019. The amount of machinery is predominantly based around Tour requirements and the tasks Chris and his team need to carry out each morning, but this will be weather dependent. "We are working alongside the Tour agronomy team, as they have experience of operating these events week in week out. They know how a golf course needs to be set up, what time it takes to prep and changes to make if things don't quite go to plan. They know what works and we are enjoying working alongside them." John Deere Limited Turf Division Sales Manager, Chris Meacock said: "Additional tournament support machinery, as well as staff from both John Deere and the local dealership, are regularly provided to supplement the existing course maintenance fleet for major events such as the Betfred British Masters." 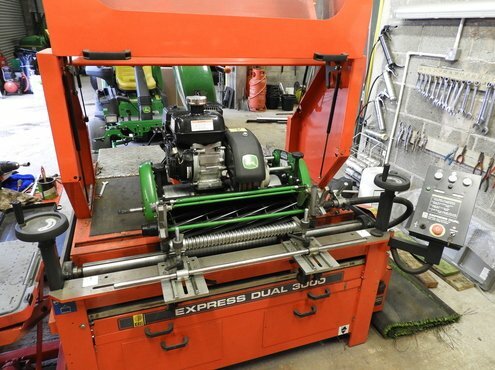 "The requirement for extra machines is driven by a number of factors, including the additional fine manicuring often required to bring the cut to PGA and LET presentation standards. For example, extra fairway mowers can be needed to cut in one direction only early each morning, to meet the R&A's minimum maintenance guideline requirements. Having machinery and support that you can rely on can be the difference between everything going smoothly or not at any tournament. 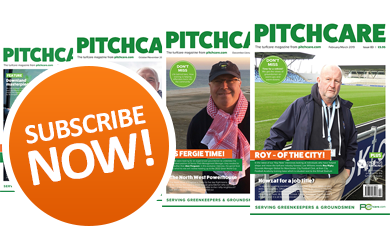 "In 2019 we are supporting more than 10 major tournaments in the UK and Ireland, every month from the British Masters at Hillside Golf Club in May to The Solheim Cup at Gleneagles in September. That will involve providing more than 150 machines including walk-behind and ride-on greens mowers, tees & surrounds, fairway and rough mowers, compact tractors and Gator utility vehicles - so we'll be busy!" "To ensure standards are maintained throughout the course preparation period as well as the four days of tournament play, and ensure the smooth running of the British Masters competition, John Deere and dealer Turner Groundscare's specialist product support managers, service staff and technicians will be working closely with Chris Ball and Ian Smith at Hillside to help keep all the machines in the fleet serviced and ready for work each day, and ensure all cutting units can achieve the highest possible quality of cut." "There is a huge amount more preparation and maintenance needed before and during these big events, which puts additional pressure on the home greenkeeping team to maintain high standards of presentation. 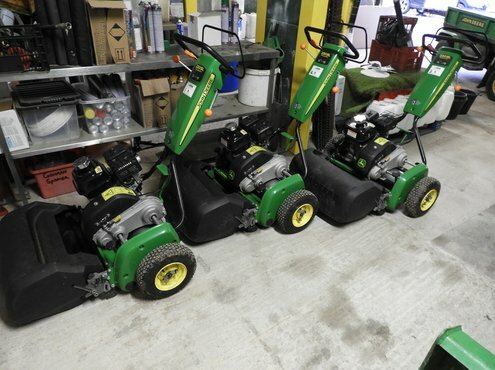 We aim to help relieve some of that pressure by not only increasing the number of John Deere mowers used on the course, but also to set them up to the club's preferred specification for things like reel size and configuration, roller type, clip rate and tyre selection. In this way they will match up to the existing machinery fleet and the cut quality can be maintained at exactly the same consistently high level across the course every day." "In addition to the specification and setting up of the machines, we also provide a 24-hour back-up service as well as overnight parts delivery from Europe if they are not held at the dealership or our parts warehouse at Langar. The approach is to help keep things running as smoothly as possible throughout the event." Chris concluded: "From experience, we find that the on-site support team quickly establishes an effective daily routine alongside the home greenkeeping team that covers any and every job that needs doing, up to and including washing the machines down and clearing away divots from the practice tee at the end of the day. Everyone involved mucks in when required and is glad to have the opportunity to contribute to such prestigious events, as well as benefit from the experience." Chris and his team are having to prepare for a two tee start every day. "This was changed due to the Premier League final fixtures being held on Sunday at 3pm, but it suits us to be honest as we can stay in the same team of people doing the same tasks from start to finish." Chris tells me what they have had to do so far, and what new ideas he has picked up. "We have changed little things like mowing the fairways in one direction, which we haven't done here before. Last week, Eddie asked can we cut our biggest fairway (17th) with two fairway mowers which took twenty-two minutes driving back round to the tee. It was suggested that, if we have an extra two John Deere fairway mowers, the time for that hole will be reduced to fifteen minutes. As well as other subtle changes, Eddie and his team have made a huge difference in helping the team produce a golf course for a major event in such short notice. John Deere are not the only suppliers of machinery and equipment. 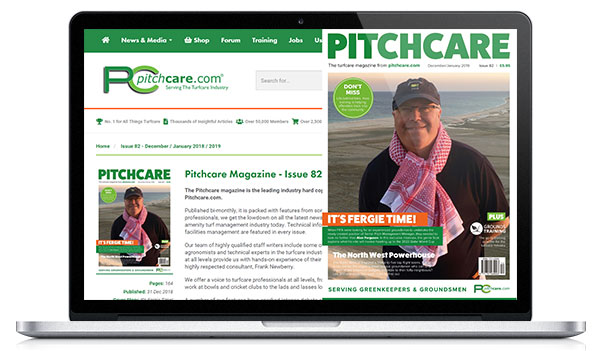 Chris continued: "We recently purchased an addition Toro ProCore from Cheshire Turf Machinery (CTM). Eddie has recommended that we need to aerate the fairways much more before the tournament so, alongside our own ProCore, CTM are providing a tractor-mounted machine which will be fitted with 8mm tines. The fairways and semi-roughs will be done before spraying with wetting agents and seaweed. Campey Turf Care have also been good to us and provided a Dakota Topdresser for a few weeks. The Tour were conscious of time before the event and didn't want us to topdress too close to the tournament, so we did this around Christmas. Richard Roberts at Hartcommon Golf Club loaned us their Vredo Disc Seeder to overseed the greens; however, we have now purchased our own as tour wanted us to get more seed into the fairways to help recover from the drought." 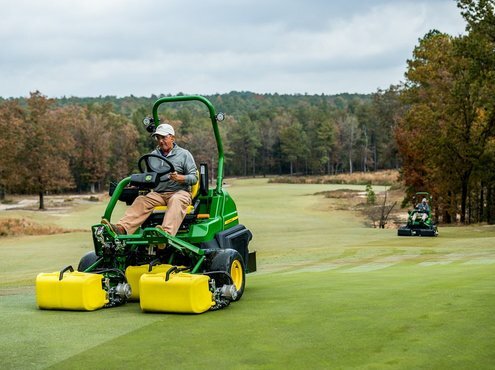 John Deere has stipulated that all the mowers (including Chris's current fleet of machinery) are to be relief ground for the duration of the tournament, because this in their opinion ensures the highest cut quality and provides the desired course finish. "Bernhard Grinders tournament support manager will be on hand with their mini relief grinder to put the relief on for us, and our club mechanic, Ian Smith, will spin all our machines on the Express Dual. " Machines will be expected to be ready each morning at 5am to start prepping the course. Chris concluded "We will be out lighting up the course as all John Deere machines are coming complete with lights and they have provided lights for our fleet." I head through to the machinery workshop to meet club mechanic Ian, who was just setting up a John Deere pedestrian cylinder mower for grinding. 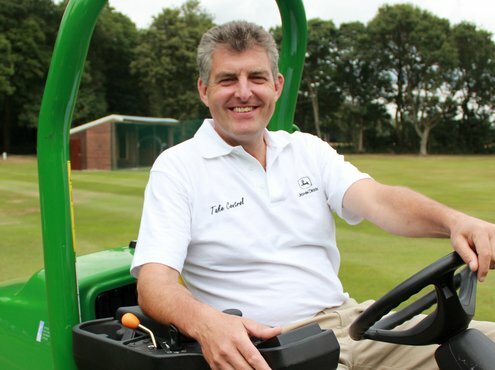 Ian joined the club ten months ago, after working for Hurlston Hall Golf Club for five years under Chris, as both a greenkeeper and a mechanic, fixing machines when required. Alongside this, Ian also worked part-time for ten years, honing his skills on Bernard Grinders. When Chris joined Hillside, he felt the club could get more use from their machines and save costs on general maintenance repairs if they employed a part-time mechanic. It was a no brainer for Chris to decide who would be perfect for the role, and Ian now works three days per week solely as a mechanic. The club have already seen the savings and benefits Ian brings to the team. I asked Ian what his previous background was. "It's always been engineering but, twelve years ago, I decided to have a change. There is a golf course at the back of my house, and it inspired me to give greenkeeping a go, which I really enjoy. I have always done the mechanic side including repairs and maintenance of all types of machines, so it seemed like a natural progression." Ian will have additional help for the tournament. "It's a huge relief to know I won't be on my own. The support from both John Deere and Bernhard's will help greatly to take the pressure off." Ian will be expected to have the machines ready for the next morning. Ian explains, "As soon as the machines come in after the morning's preparations, they will all be given the once over by the John Deere mechanic and myself, and any repairs will be carried out. The pedestrian cylinder mowers will all be reground after each use and, if required, we will regrind any other cylinders that may have been damaged by a stone or debris, but this will be unlikely." 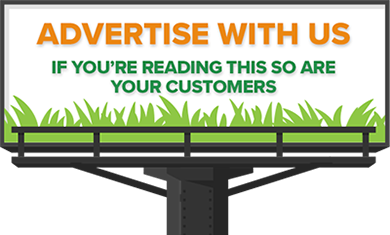 Ian is not short on parts as they have an agreement with Turner Groundcare, who stock high wear items for each machine and service parts twelve months of the year. "The system we have in place is excellent. Every month, we will report back to Turner's what we have used, and we will be billed for the items, they then replenish the stock, so we are never caught short. It does not cost the club to hold the stock, and it makes my job easier and much more efficient when the lads can be back on a machine hours after a breakdown." Ian tells me he's looking forward to the challenge and it will be a great experience working in such a big event. what developments are required to get the course ready to host the prestigious tournament.